We have recently reviewed RADEON X1900 XTX from ASUS. And today we are going to review essentially the same card from Sapphire. As it's hard for a compere to moderate a concert, when two actors perform one and the same scene in the same style, it's also very hard for reviewers to write about the same card wrapped in different boxes as about different products from different companies. It's even easier for a compere, as each actor brings something unique to his performance, so there will be no complete match. 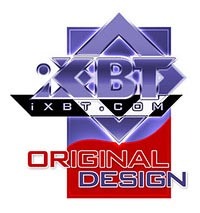 And in our case all X1900 XTX cards are manufactured by Canadian ATI (to be more exact, this company orders them), so they are all the same, they differ only in boxes, bundles, and certainly prices. 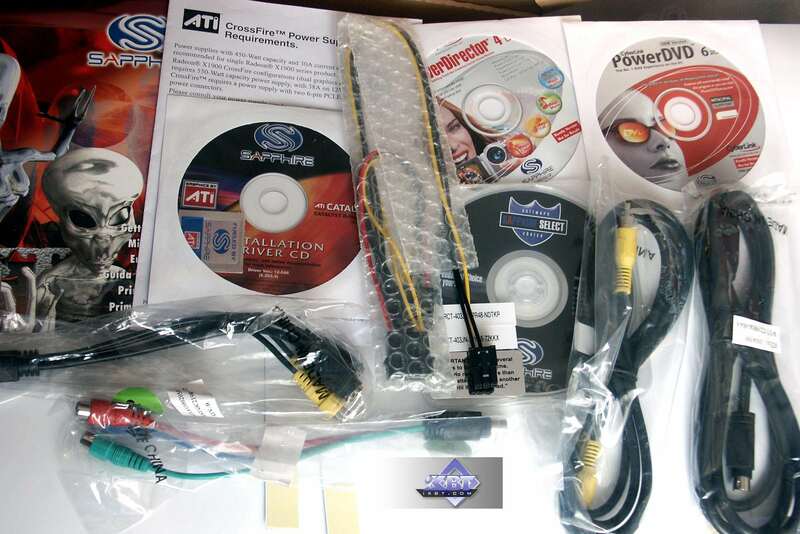 Today we are going to review two currently the most powerful ATI accelerators from Sapphire. One of them is a regular X1900 XTX, the other one is equipped with a special water cooling system. 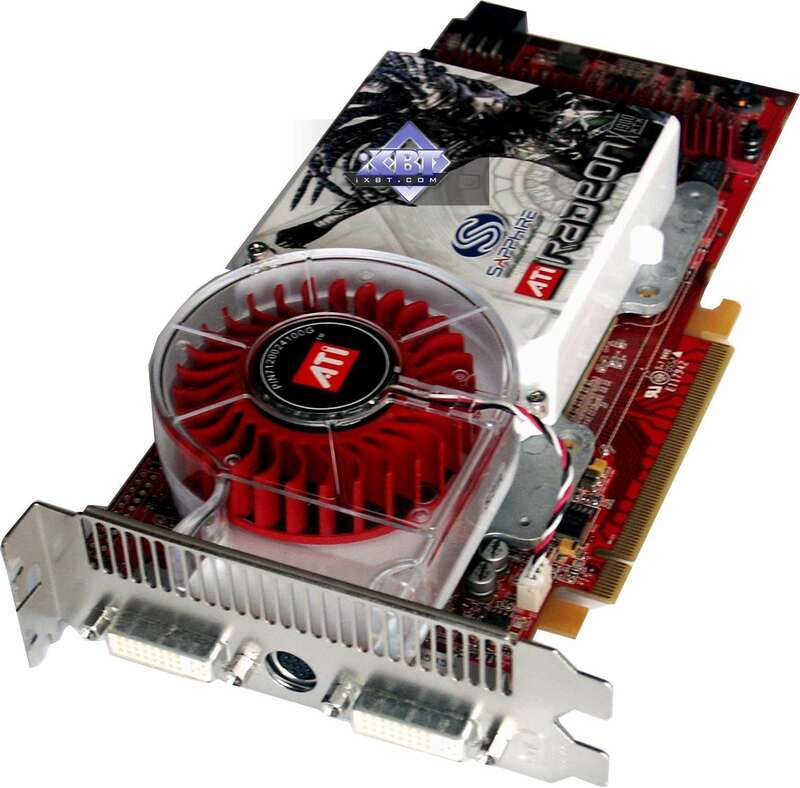 What concerns the market situation, it does not favour GeForce 7900 GTX so far. 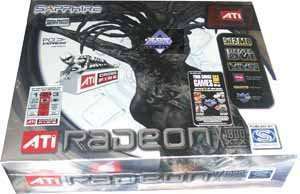 Its prices on the Russian market are higher than for the X1900 XTX, so the ATI product can take advantage of this fact. Back in the first article on the 7900 series I wrote that popularity of this or that competitor would depend on pricing. 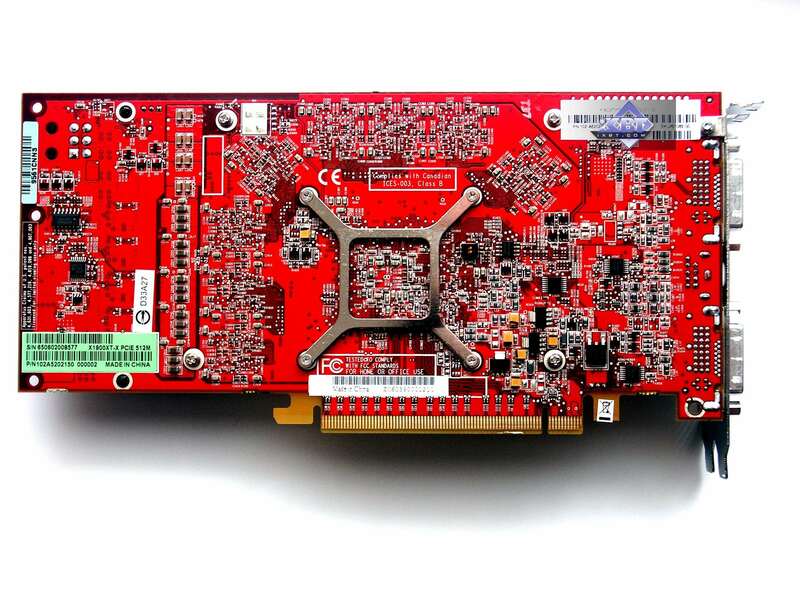 I must admit though that the 7900 GTX has a huge advantage - it does not get very hot and its cooling system is very quiet! Unlike the heater of the X1900 XTX, which core temperature easily grows to 90-100°C. And the cooler gets noticeably noisy. Here is when a cunning Sapphire device comes in handy. But it will be described below. Dimensions: 205x100x32 mm (the last figure is the maximum thickness of a video card) plus 180x100x16 mm - dimensions of the cooling unit. 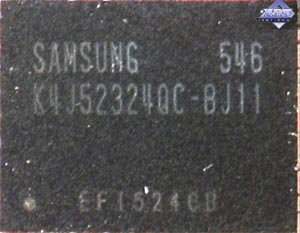 The cards have 512 MB GDDR3 SDRAM allocated in 8 chips on the front side of the PCB. I guess there is no point in describing the cards - reference design. No modifications at all. I guess there is no point in describing the cooling system on the first card - it's of the reference design, we have already written about it many times. 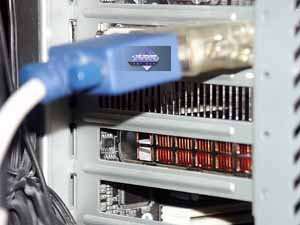 The "ginger" of Blizzard is a cooling system. It resembles the Thermaltake device we already reviewed . 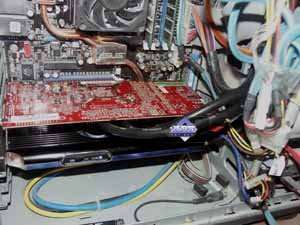 That is it's a water cooling system. 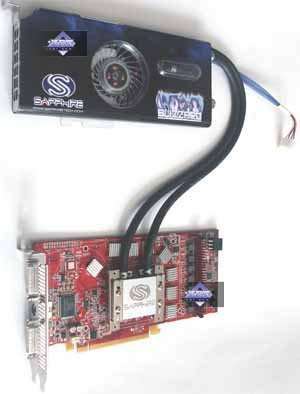 The card has a GPU unit, which is piped to a large cooling unit (nearly as large as the card itself) that takes up an additional slot in a PC case. Unfortunately, our sample came with a two-slot bracket, which is not required now. 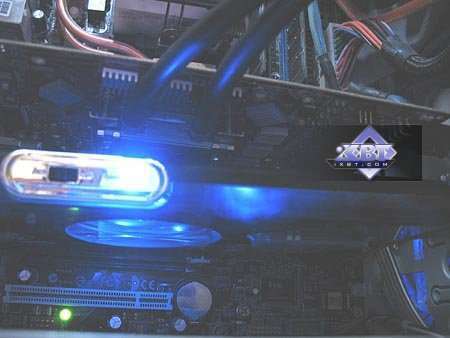 But production-line cards will be bundled with a single-slot bracket, so the expansion tank can be installed into the next slot after the video card. Thus, Blizzard will take up as much space as the reference card. 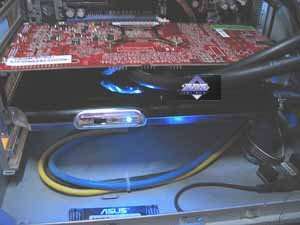 Photos below show Blizzard installed into a system unit. 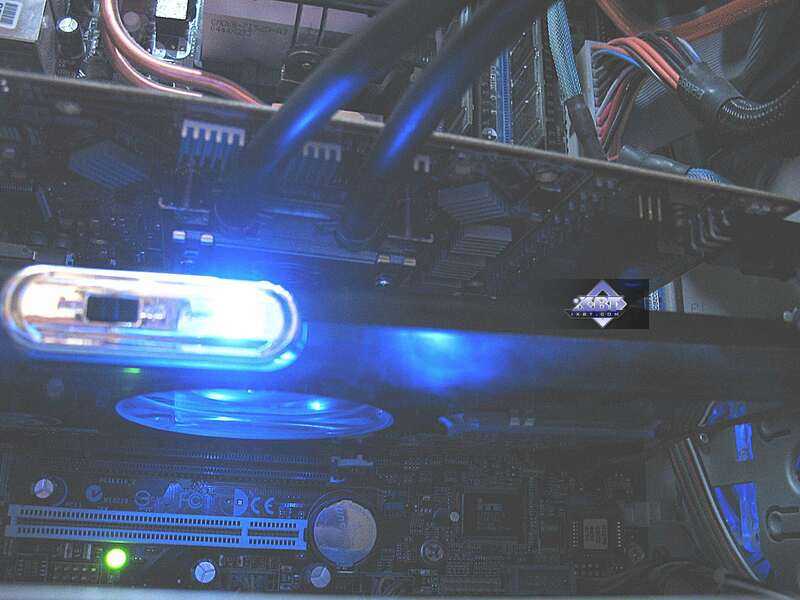 Water cooling fan (which also makes the water circulate) is illuminated. On the whole, the device is elegant and robust. 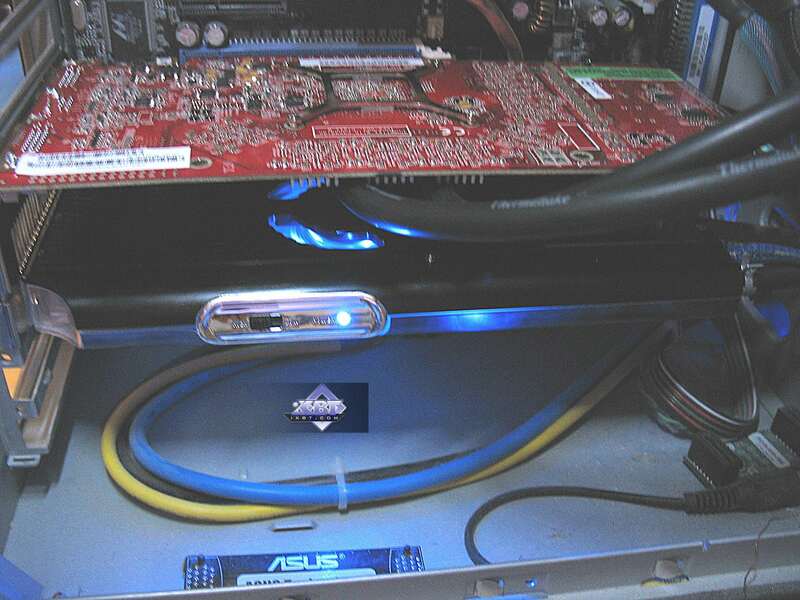 Fan speed is controlled with a slider on the cooling unit. Memory chips are equipped with heatsinks. Such a complex cooling system allows the manufacturer to raise frequencies from 650/1550 MHz to 675/1600 MHz. Of course, that's not much of overclocking and it will have little effect on performance, but it's still indicative. The same bundle as in the previous case. The company changed its package design more than a year and a half ago. These packages now have bright jackets with cardboard boxes inside. Bundle components are arranged into sections. 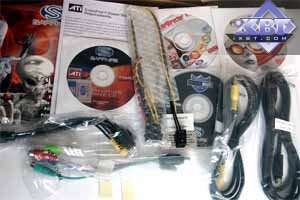 Packages used to have windows to demonstrate video cards - it made them more attractive and more convenient for users. But now for some reason the company decided to give up plastic inside the box as well as windows. That's a pity. They shouldn't have spoilt the best they did by drawing another mummy from the British museum or a cross between a designer and a hydra. They seem to have heard my wishes! We got windows and plastic back. But they have gone from one extreme to another: the entire box is made of plastic; but it's too fragile and these turbid windows show little of the product inside: you can barely make out something suspended inside. Box dimensions are mind-boggling. 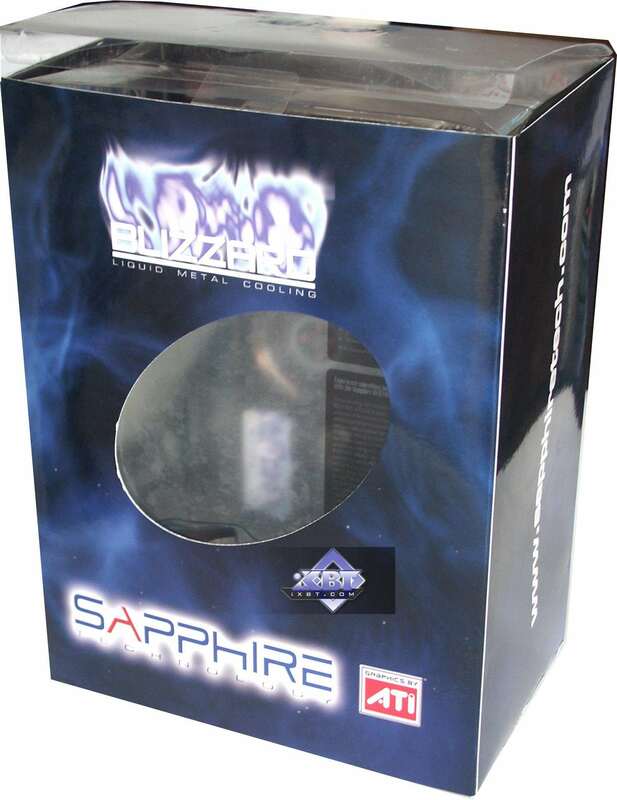 Who works as a designer in Sapphire, I wonder? a Chinese released from a lunatic asylum for good conduct or another Malevich the avant-gardist? Images on Sapphire boxes offer no end of work for psychiatrists. Especially when a happy owner of the super card sees a wry face of a product of gene engineering or of designer's depression at best. The Main Point. 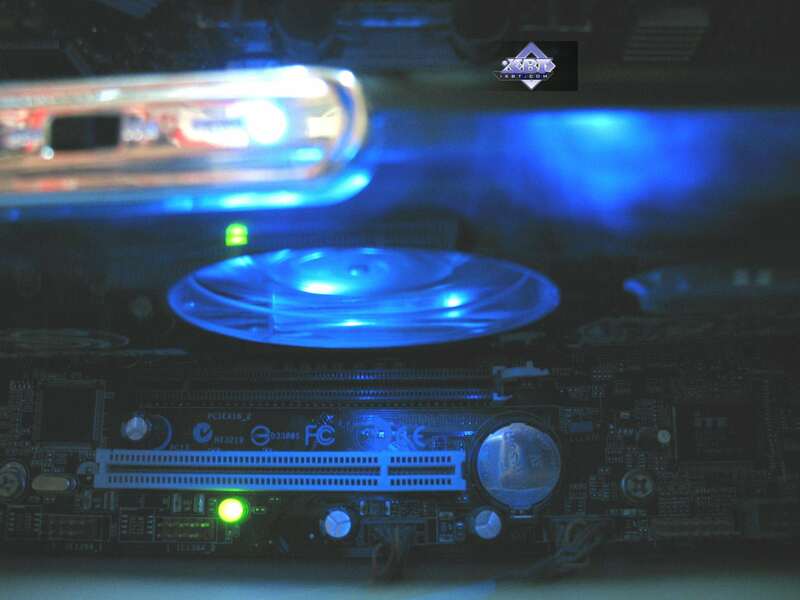 A water cooling system on Blizzard provided not only a quieter cooler (versus the reference one), but also lower operating temperatures of the card, DESPITE THE INCREASED FREQUENCIES! 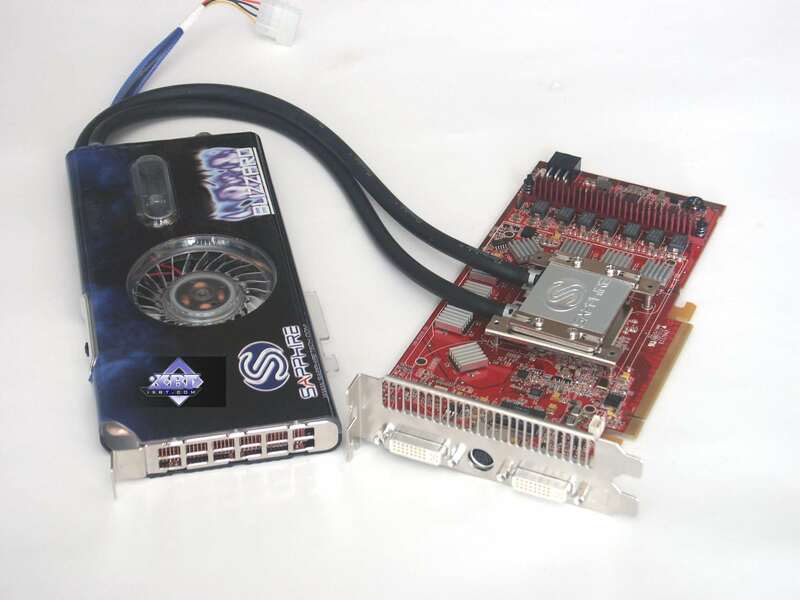 It's well known that temperature of the GPU on the reference card may reach 95°C and even 100°C. 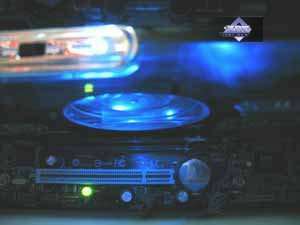 Up to 90°C in a well ventilated PC case. 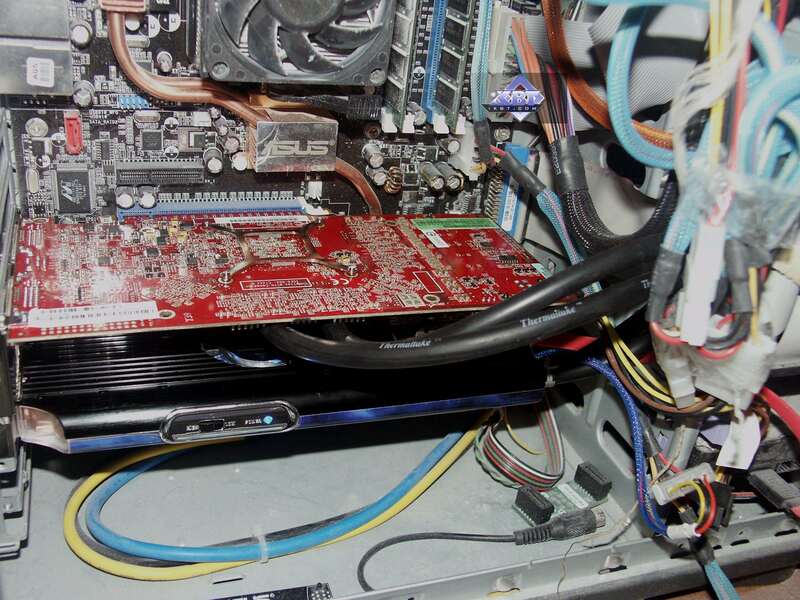 Blizzard keeps the GPU temperature below 85°C in all conditions! The temperature does not exceed this figure under the heaviest load! And the cooler still operates at minimum speed! That's efficiency! 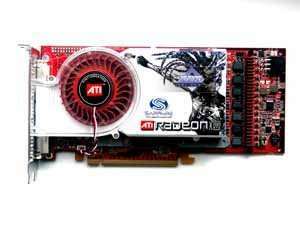 What concerns overclocking on the whole, the GPU offers a good potential - 720 MHz. But the situation with memory is bad, as memory voltage is reduced (cooling has nothing to do with it), so artifacts start appearing above 1620 MHz, alas. The above diagrams lack the X1900 XTX card at 675/1600 MHz. Just add 5% (maximum 8%) to get these results. 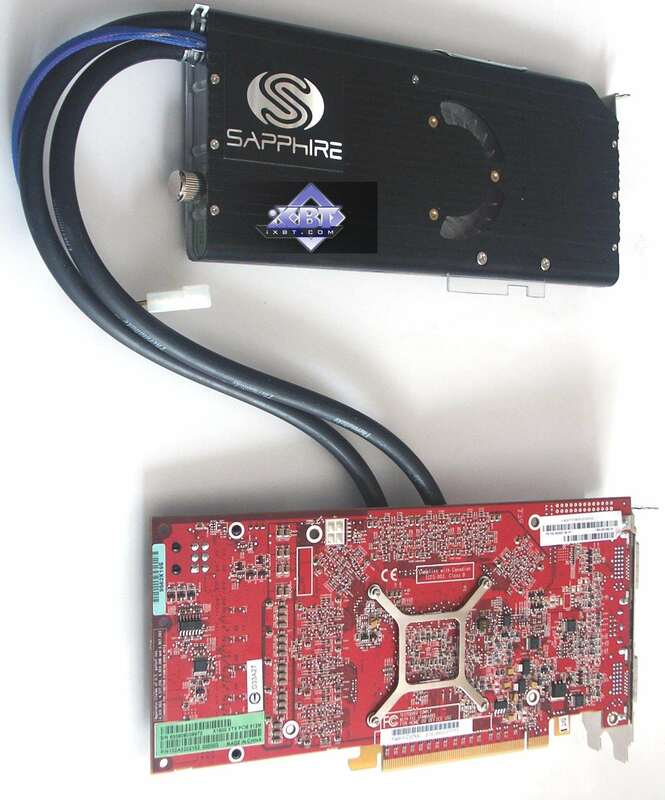 Sapphire RADEON X1900 XTX 512MB PCI-E is just a reference card. I repeat for n-th time that no one manufactures X1900 cards on its own. So you just compare the prices and choose a card. The bundle of this card is quite good. The quality of this product is very high, we have no gripes with it (except for the hot GPU and growing cooler noise). 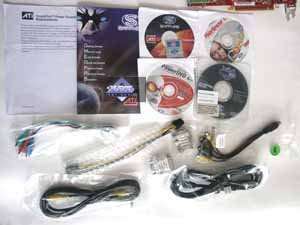 Sapphire Blizzard RADEON X1900 XTX 512MB PCI-E is an excellent overhaul of the previous card. The cooling system is highly efficient. 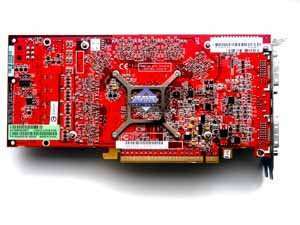 Thanks to its higher frequencies, this accelerator is actually the fastest model these days. So if the price difference between this product and a regular X1900 XTX is not very large, you should pay closer attention to Blizzard. And if this accelerator is cheaper than the GeForce 7900 GTX, you shouldn't hesitate - take it immediately (of course, if you can afford it and if you plan on buying a Hi-End product). 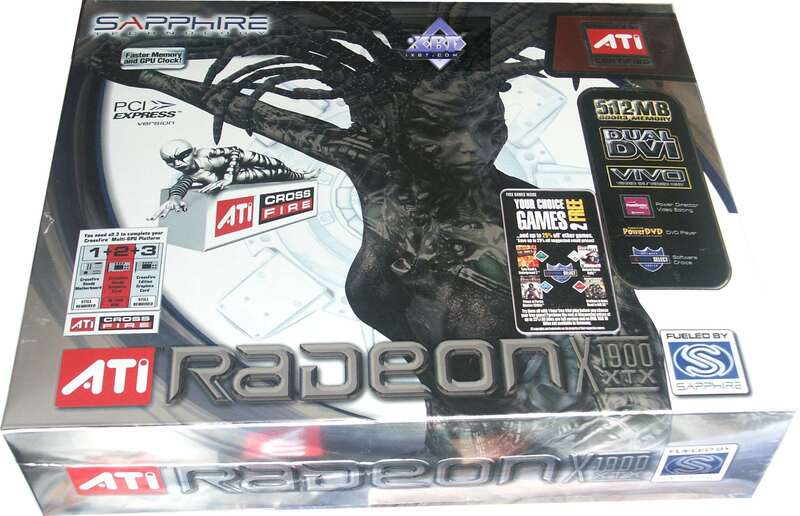 Sapphire Blizzard RADEON X1900 XTX 512MB PCI-E gets the Original Design award (April).